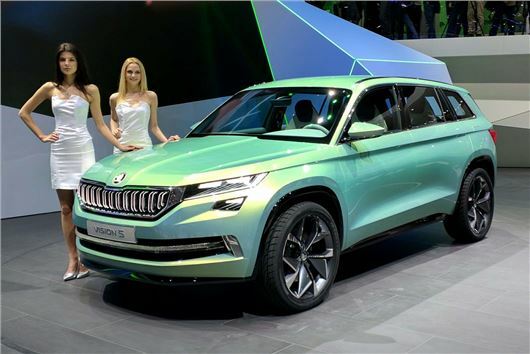 Skoda’s new SUV at the Geneva Motor Show! Stay tuned with AutoCater to catch up on Exciting & Latest News. 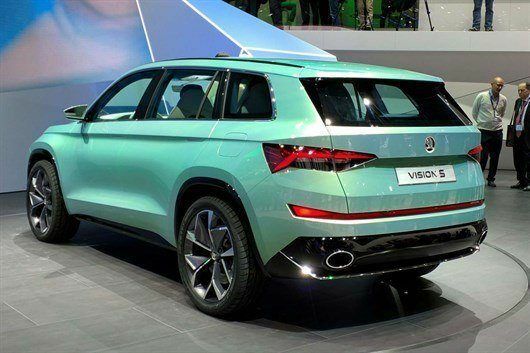 Skoda has revealed the VisionS concept large SUV which is likely to be called the Kodiak. This concept is a hybrid having made its debut at the 2016 Geneva Motor Show. It looks sharp, aggressive character lines on the bonnet, front bumper, side profile and the rear. The sloping roofline compliments the entire design of the car. The concept SUV comes with 3 rows of seats, offering space for 6 passengers. In terms of overall dimensions, the car is 4,700mm long, 1,910mm wide, and has a height of 1,680mm. The VisionS Concept has also been equipped with flush-mounted door handles, a dual exhaust system, and a tailgate spoiler. The SUV is powered by a petrol-electric hybrid powerterain – a 154bhp (with 250Nm of torque) 1.4-litre petrol motor paired to 2 electric motors, a 54bhp (with 220Nm) gearbox-mounted unit and a 114bhp (with 270Nm) rear axle-mounted motor. The total system output for the hybrid powerterain is rated at 222bhp and gives the car a so-called ‘smart’ all-wheel drive (AWD) system without the need for mechanical coupling. Power is channelled to the wheels via a 6-speed DSG automatic gearbox. The people at Skoda claim that the car is capable of going from 0-100 kmph in 7.4 seconds and has an all-electric range of about 50 km. The total range for the hybrid powerterain is claimed to be around 1,000 km. As with most electric and hybrid vehicles, drivers can choose to operate the VisionS purely on electric power, or activate the petrol engine to aid progress and recharge the battery. The VisionS Concept is equipped with a 6 seats and comes filled to the brim with technology. There’s a digital instrument cluster, a front-passenger infotainment system, touchscreen controls and also a digital centre stack. There’s premium leather upholstery on offer and the passengers at the rear won’t be disappointed either because of the a rear-seat entertainment system. The production version is likely to be equipped with the same 4-cylinder engines that are seen on the international Superb, with a 1.6-litre turbocharged diesel unit forming the base engine. A diesel-electric hybrid version of the SUV will also be offered, and 4-wheel drive will be optional on most models. Audi setting itself with the Launch of its new ‘Q’ Model. Stay tuned with AutoCater to catch up on Exciting & Latest News. GATIMAAN Express: What is has to offer? Stay tuned with AutoCater to catch up on Exciting & Latest News. Hi, constantly i used to check web site posts here early in the morning, because i enjoy to find out more and more. Great write-up, I am normal visitor of oneˇs site, maintain up the nice operate, and It is going to be a regular visitor for a lengthy time. This video post is in fact wonderful, the noise feature and the picture feature of this video post is genuinely amazing. What’s up, I check your blog like every week. Your writing style is witty, keep it up!